Hot on the heels of Otto Preminger’s classic Laura came Fallen Angel – a noir that clearly was meant to tap into the former’s success by utilizing several of the same cast members and technical crew. Fallen Angel explores the similar theme of sexual obsession but takes place in a much different setting. 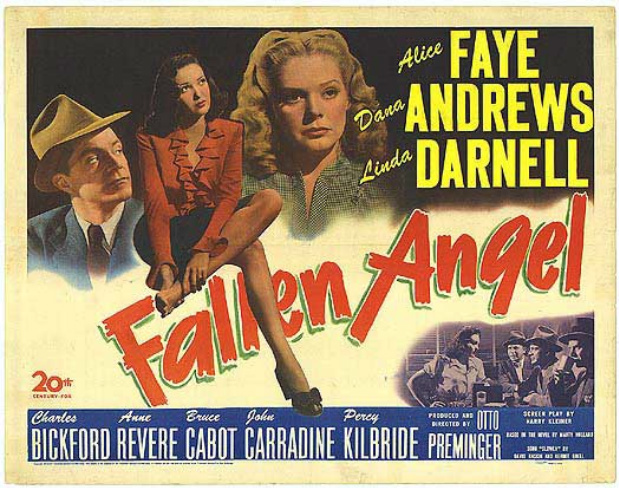 Besides exploiting the success of Laura, studio chief Darryl Zanuck wanted to use Fallen Angel as a vehicle for musical star Alice Faye to break into dramatic roles. Her role in the film is overshadowed, however, by the painfully sultry Linda Darnell, who can ruin a man’s life just by walking in the room. The heady brew of sexual suggestion, obsession, and Preminger’s knack for ambiguous characterization make Fallen Angel one steamy walk on the dark side.